Please refer to this website when you have questions. The information will be updated as significant changes to the airfield are made. PHASE FOUR of the construction project is now underway. It should be noted that the runway magnetic compass heading has shifted slightly over the years, and runway 16/34 has been renamed to runway 17/35. The temporary runway 35 Instrument Landing System (ILS) is operational, and Precision Approach Path Indicators (PAPI) are available on both ends of the runway. As the project progresses, construction phasing will create the need to close some existing taxiway connectors. When this occurs, diagrams will be posted here. Please be aware that NOTAMs will be issued frequently relating to the night closure of the airfield, which will most always occur between the hours of 12:00am and 5:30am, depending on commercial flight schedules. Airfield closure periods will generally be from 12:00am to 5:30am, but may be adjusted when necessary. Please check NOTAMS for the most up-to-date information. The west-side taxiway/temporary runway (Runway 17/35) was constructed 475 feet west of the existing (now closed) Runway 16/34 at AVL. This temporary runway is 7,000 feet long by 100 feet wide, and can support the maximum weights of the entire aircraft fleet mix presently using the airport, including MD-88 and Airbus A319/320 aircraft. The temporary runway surface was constructed of asphalt and is grooved, and is equipped with a single Category I Instrument Landing System (ILS) serving temporary Runway 35. It is also equipped with a PAPI and REILs, but it does not have a MALSR. It has all customary pavement markings and lighting systems, and has a GPS approach. Runway 17 has a Landing Distance Available (LDA) of 6,600 feet, due to the inability to provide a full 1,000 foot safety area off the south end of the temporary runway. During the period that the temporary runway is operational, taxi routes to and from the runway and other parts of the airport will occasionally change as construction on the new permanent runway progresses. Although Temporary Runway 17/35 is 100 feet wide, it is served by multiple connector taxiways that meet Airplane Design Group IV standards. 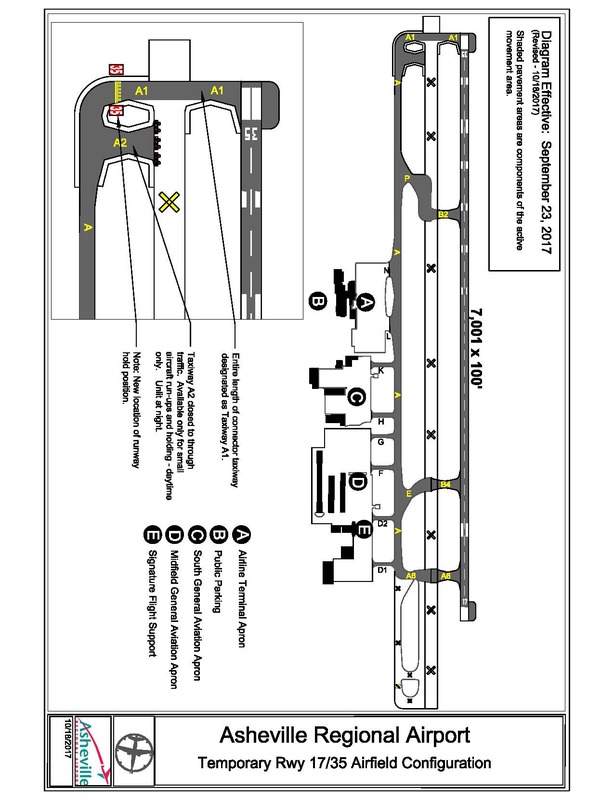 Upon commissioning of the new permanent runway, the temporary runway will revert to a permanent taxiway which will meet Airplane Design Group IV criteria, and as such, all connector taxiways have been constructed to these design standards from the very beginning. This ensures that no aircraft of any size operating on the temporary runway encounters any issues while turning on or off the runway as it navigates the fillets and turn radius of any connector taxiway. Additionally, at both ends of the temporary runway, an oversized paved turnaround area is constructed which ensures that the full mix of aircraft using the temporary runway, including MD88 aircraft, are capable of conducting a 180 degree turn on the runway with a large safety margin. After commissioning of Temporary Runway 17/35, the existing main runway was demolished, so a new permanent main runway could be constructed in its place with a minor realignment to meet current FAA standards. Upon commissioning of the new permanent runway, the temporary runway will revert permanently to a west-side taxiway. The new runway is planned to open in 2018, with additional work on certain Navaids and other close-out items continuing into 2018. The FAA does not permit construction activity to take place inside a Runway Safety Area (RSA) while that runway is operational. For that reason, at different times throughout the project, extended periods of overnight closures of the existing and temporary runway will be required in order for the needed construction activity to take place. Although the actual times may vary depending upon flight schedules and circumstances, during these periods, the runway will generally be closed between the hours of 12:00am and 5:30am daily. At this time, it is likely that overnight closures will occur throughout 2017. NOTAMs will be issued as required. NOTE: Pilots should consult NOTAMS for the most up-to-date information.